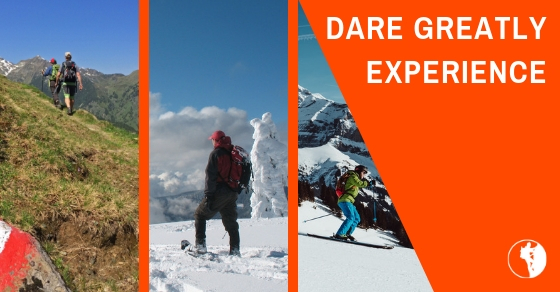 Take A Break From Your Over-Stressed Life And Gift Yourself A 4-Day Dare Greatly Skiing Experience. The itinerary can vary depending on weather and slope conditions as well as on your actual physical condition and your skiing experience. Changing the itinerary lies entirely within the discretion and responsibility of the Dare Greatly Guiding & Coaching. Your safety is our top priority! Having said that this is what the itinerary looks like. You arrive in Austria at the hotel where you’ll stay for the duration of the Dare Greatly Experience. As people from all over the world book this Experience, you will have to make your own travel arrangements. After the morning session a guided ski safari on prepared slopes is scheduled which of course is tailored to your fitness level and skiing experience. Skiing lessons as well as rental equipment can be arranged for all level of skiers, from beginner to expert (not included). After breakfast we say goodbye. It’s up to you whether you immediately travel home or extend your stay and discover more of Austria. Perhaps discover some of the rest of Europe too, since Austria’s central location makes it an ideal starting point for discovering more of this beautiful part of the world. For anyone who wants, needs to escape – if only for a little while – their over-stressed life and find refuge from all its noise. Finally allow yourself to mentally relax enough so you can come back to yourself and breathe again!